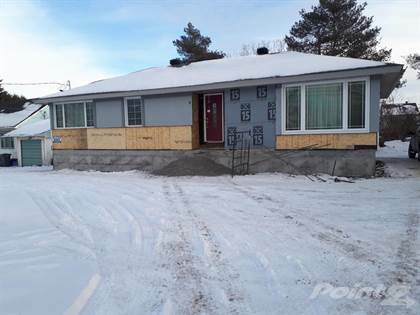 This tastefully renovated, 3 bedroom bungalow has been moved onto a brand new 9 foot high, concrete foundation with oversized windows, brand new high efficiency furnace, rough in for laundry and 4 piece bath and new 200 amp breaker panel. This home features gleaming maple hardwood floors throughout, excepting tasteful ceramic tile in the kitchen.. The kitchen boasts all new appliances, trendy granite counter tops and a California server to the living room, ideal for entertaining. A walkway and landing shall be added to the front entrance way. This huge lot offers lots of parking for family, guests or any toys you may have. Stone masonry will be added to the front of the house below the windows and accented with a tasteful modern stucco. A new deck shall be added to the existing rear patio door. This property has future investment potential, due to it's unique location, high traffic, high profile and ideal for a home occupation.Taxes to be verified. This property has full urban services as well as high speed internet, natural gas and 200 amp. electrical service. This property is owned by the listing agents. Hi, I'd like to find out more information about 1202 Carp Road. Thanks so much!